Researchers at the Department of Energy’s Pacific Northwest National Laboratory will be among the projected 2,000 energy experts from more than 16 countries that will attend the ARPA-E Energy Innovation Summit March 13 through 15. The ninth-annual event will be held at the Gaylord Convention Center in National Harbor, Maryland. The summit's Technology Showcase will feature hundreds of technologies—including those from PNNL—that will shape America’s future energy industry. A summary of PNNL’s exhibits follows. 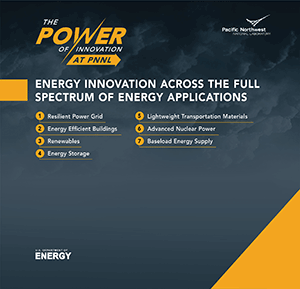 The Partner Pavilion booth features several of PNNL’s energy research areas in the power grid, energy efficient buildings, renewable energy, energy storage, lightweight transportation, advanced nuclear power and baseload energy supply. In addition, an aqueous redox flow battery technology will be on display. The battery is projected to cost 60 percent less than today’s standard flow batteries without compromising energy storage. The lower cost is due to active materials consisting of inexpensive organic molecules, compared to the commodity metals used in today’s flow batteries. It is available for commercialization. The Bump Test and Evaluation for Volt/VAR Optimization (VVO) Software System also will be featured and is available for commercialization. Regulatory authorities require utilities to validate the effectiveness of their VVO systems for peak and energy reductions. But validation typically requires an expensive, two- to three-month on/off evaluation process. This new software, however, enables accurate evaluation in just two weeks, saving time and money. And, if integrated into VVO tools, it could show system performance not just when commissioned, but continually. Demand for electricity keeps changing, and the grid now requires more efficient optimization methods for short-term operation, long-term planning and disaster restoration. PNNL is partnering with the National Rural Electric Cooperative Association (NRECA), GE Grid Solutions, PJM Interconnection, Avista Utilities and California Independent System Operator to develop a sustainable data evolution technology (SDET) tool. The goal of SDET is to create open-access transmission and distribution power grid datasets, as well as data-creation tools that the grid community can use to create new datasets based on user requirements and changing grid complexity. New operational paradigms for the electricity grid are required to meet the increase in renewable generation and distributed energy resource (DERs), while providing the quality of service, resiliency and reliability that customers expect. In an effort to improve predictability for utilities, PNNL researchers are developing and testing a hierarchical control framework for coordinating the flexibility of a full range of DERs. These include residential and commercial building loads, electric vehicles and photovoltaic inverters to supply reserves to the electric power grid. The United Technologies Research Center, Southern California Edison, GE Grid Solutions, PJM Interconnection and California ISO are partnering with PNNL to develop the tool. The power modeling community is in need of robust, transformational models and scenarios to address grid complexity today and into the future with a large-scale, dynamic, open-access system that will support the online power operations community. To meet this need, PNNL and NRECA teamed to develop an integrated, user-defined solution known as the Data Repository for Power System Open Models with Evolving Resources, or DR POWER. The DR POWER approach will review, annotate and verify submitted datasets while establishing a repository and a web portal to distribute open-access models and scenarios. It will include the ability to collaboratively build, refine and review a range of large-scale, realistic, power-system models. It also will include datasets created by other GRID DATA projects. As the power grid evolves with the integration of renewable energy and changing electricity demand patterns, calculating resource schedules becomes more complex and the probability for error increases. High-Performance Power Grid Optimization, or HIPPO, is a new computational tool to help grid operators generate tomorrow’s electricity more efficiently and in a fraction of the time. HIPPO is being developed and validated by a research team led by PNNL, along with partners at Midcontinent Independent Service Operator, GE Grid Solutions and Gurobi Optimization. Agriculture, information technologies, molecular phenotyping, genomics, drones and engineering intersect to form the technical basis of the Consortium for Advanced Sorghum Phenomics, or CASP. The goal of CASP is to identify drought-tolerant agriculture crops for use in biofuel production. Led by PNNL, researchers are using novel phenotyping platforms, predictive modeling techniques, and image processing tools to capture plant traits at the plot level from emergence to harvest as well as plant growth and yield. The project focuses on simulating drought and salinity stresses to develop plant varieties that are more resilient to extreme environmental challenges. Using drones, Blue River Technology is developing autonomous phenotyping systems that can measure plant traits required for selection of drought- and saline-tolerant lines and yield prediction. Other industry partners will advance improved commercial seed cultivars. The CASP partnership also includes Lawrence Berkeley National Laboratory, Chromatin Inc. and Kearney Agricultural Research & Extension Center. One of the drones used in the research will be on display in the PNNL booth. For more information, contact energyenvironment@pnnl.gov and be sure to follow #ARPAE18 on Twitter.